Preheat oven to 350 degrees. In a mixing bowl, cream the sugar, shortening, eggs and vanilla until smooth. Add the flour, salt, soda and cinnamon and stir to blend. Stir in the nuts, raisins, and green tomatoes. Grease a 9-by-13-inch pan. Pour the batter into the pan and sprinkle the coconut on top. Bake for 1 hour. Joyce Ramey • Greeley, Colo.
Preheat oven to 350 degrees. For streusel, combine brown sugar and cinnamon in small bowl. Cut 1/3 cup butter with pastry blender or 2 knives. Stir in nuts and set aside. 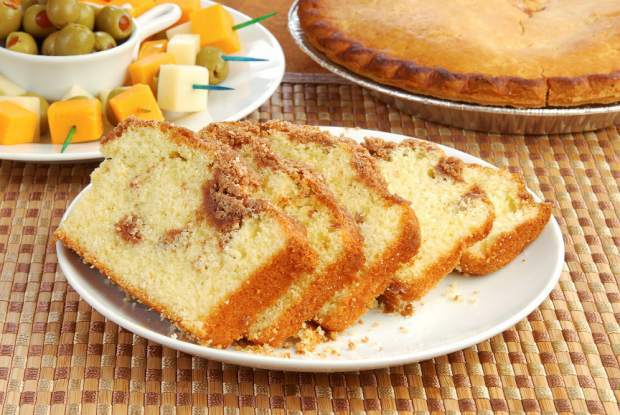 For cake, combine cake mix, pumpkin, eggs and 1/4 cup butter in a large mixing bowl. Beat at medium speed with electric mixer for 2 minutes. Spread half of batter into ungreased 13-by-9-by-2-inch pan. Sprinkle half of streusel over batter. Spread remaining batter over streusel. Top with remaining streusel. Bake 40-45 minutes or until toothpick inserted into center comes out clean. Makes 12 to 16 servings. Preheat oven to 350 degrees. Coat a 9-inch round cake pan with cooking spray and dust with 1 tablespoon flour. Weigh or lightly spoon 6.75 ounces flour into dry measuring cups. Level with a knife. Combine 6.75 ounces flour, baking powder, salt and cinnamon in a small bowl, stirring with a whisk. Place granulated sugar and butter in a large bowl and beat with a mixer until well blended. Beat in vanilla and egg. Beat in flour mixture alternately with milk, beginning and ending with flour mixture. Fold in apple, raisins and walnuts. Scrape batter into prepared pan. Bake at 350 degrees for 30 minutes or until a wooden pick inserted in the center comes out clean. Cool 10 minutes in pan on a wire rack. Remove from pan and cool completely on wire rack. Sift powdered sugar over cake and cut into wedges. Preheat oven to 350 degrees. Grease and flour two 8-inch round cake pans. Sift together the flour, cocoa powder, baking powder and salt. Set aside. Melt the bittersweet chocolate in a cup in the microwave, stirring every 15 seconds until smooth. In a large bowl, beat the butter and sugar with an electric mixer until light and fluffy. Mix in the mashed potatoes and then the eggs, one at a time. Stir in the melted chocolate. Stir in the dry ingredients, alternating with the milk, just until everything is mixed. Divide evenly between the prepared pans and smooth the surface if needed. Bake in the preheated oven until a knife inserted into the center of the cake comes out clean, 25 to 30 minutes. Cool in the pans set over a wire rack. Beat butter and peanut butter. Gradually add sugar and beat until light and fluffy. Add eggs, beating well after each egg. In a medium bowl, sift together flour, baking powder and salt. Add to creamed mixture alternately with milk, beginning and ending with flour mixture. Add vanilla. Pour batter into 2 prepared 9-inch round pans. Bake 30-35 minutes or until toothpick comes out clean. For frosting, beat together butter and peanut butter. Add vanilla and powdered sugar alternately with milk. Beat until smooth. Spread on sides and top of cake. Sprinkle chopped nuts on top. Marsha Konken • Sterling, Colo. Beat the cake mix, juice and eggs. Pour into an 8-by-8-inch or 9-by-9-inch cake pan that has been sprayed with nonstick spray. Bake for 27-32 minutes for 8-by-8-inch pan and 23-28 minutes for 9-by-9-inch pan at 350 degrees. Cool 10 minutes. Remove from pans and cool completely. Cut each layer in half. Spread pie filling between layers. Frost cake with cream cheese frosting. Store, covered, in refrigerator.